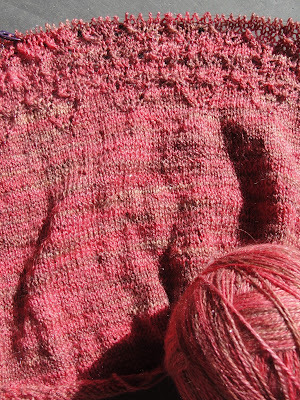 So here it is....progress so far on my Quite Continental BooKnits shawl which I am doing as a Knit-a-long. I am about two thirds through the second lace section and starting to find things a little less stop and start, and a bit more natural. After this section the final lace section is a little shorter again and then the bind off, which I am still unsure about, having read some more experienced knitters' questions. I decided to bead this, despite the fact I am not terrible 'blingy' but I was up for the challenge, and the beads are indeed very subtle. I am using tiny beads (I think smaller than intended) and a 0.6 crochet hook to put them on with....it makes me realise what painstaking work those crochet edges on old family tablecloths must have been. Despite the very steep learning curve, and on occasion dropping stitches and not having a clue how to 'read' the stitches and rectify it, I am enjoying the knit and hoping that my blocking will work miracles! Please tell me it will!! I thankfully got the answers I needed to my unbalanced increases and am forever grateful to the blogging/ravelry community and to Annie who solved the issue in one sentence. To catch up with all the other intrepid knitters....call on over to Sarah's blog, Crafts from the Cwtch for the weekly link-up. Faith it is just fantastic and yes blocking will open it up. I blocked mine out very hard and it opened up like a window. I love how subtle the beads are and they will be more visible after blocking. The last lace section is quick but be prepared to give a good evening and maybe a bit to do the picot edge. I didn't expect that to take so long but I had a major case of wanting it off the needles to see it so that probably didn't help lol. Oh Faith--I am so in love with the color of your yarn! I need to be braver with my yarn choices and pick more lighter colored ones--I always tend to the darker, even though I love those lighter colors! I think your shawl will open up a lot with blocking--I am hoping mine will too as my yarn is quite springy/spongey--the picot bind off is my favorite for feminine items and totally worth the time it takes to do. Can't wait to see it all blocked! Such a pretty colour! I really admire you for having a go at this, I can't imagine ever being able to knit something so pretty thought one day I'd like to try. I think blocking will make the world of difference. Terrific progress and check that out! You're beading. Go on with your bad self! You go. 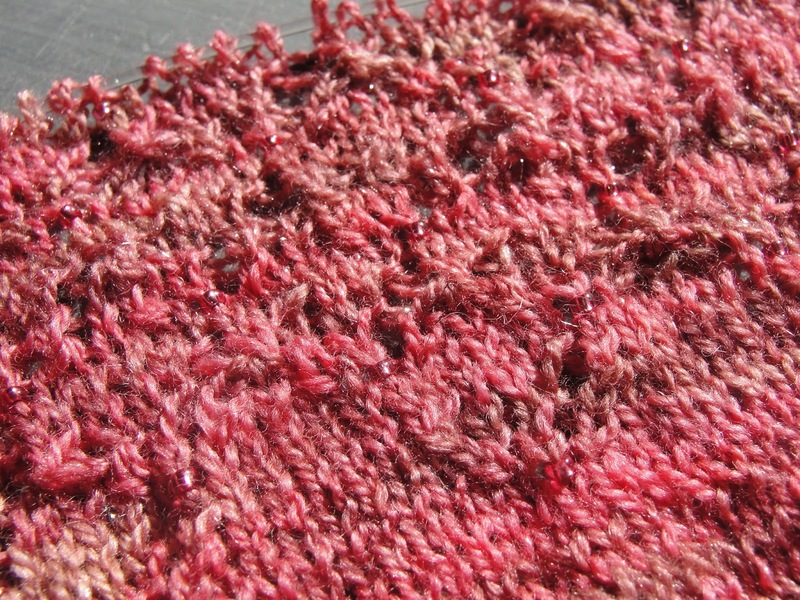 Faith, your shawl is looking terrific, I love the color. Hi Faith...I'm catching up this morning after a little break and your shawl project is looking beautiful...the beads are a lovely addition too! I find blocking sorts out all kinds of issues...it's like performing a magic trick and your shawl will be perfect! You're welcome m'dear :) Gorgeously subtle beading going on here. I just wish I'd been able to join the KAL too, but I still have a sore shoulder. Next time, she sighs. Hey Faith, I am envious of your knitting skills, your shawl looks great. It will wonderful when finished and blocked and the beads add an extra something to it.......a nice, subtle bit of bling. Wow, Faith, it's so beautiful, and those beads are the perfect touch. Love that yarn too - so warm and kind of cinnamon-y looking. Where ya been girlfriend besides Austria, I see! Wow! What an amazing trip but I'm scared of heights so thanks for sharing your pictures which were wonderful.....except for one..... you're sitting there knitting and behind you it looks like a drop off and one of your little guys is bent over playing and my palms started sweating just looking at that picture! LOL! I was literally telling you to turn around!!!!! I wanted to reach through the photo and grab him before he fell off the side of the mountain! I told you I had a fear of heights! It's bad....very bad. I love your stripey blanket and I'm going to go look at her CAL....I love her stuff and didn't know she had a blog. Like I need to start another blanket! LOL! I miss you at the YOP as you were one of my favs and I always love whatever you're working on. I know you're busy though with the family. Take care and I hope you read this!